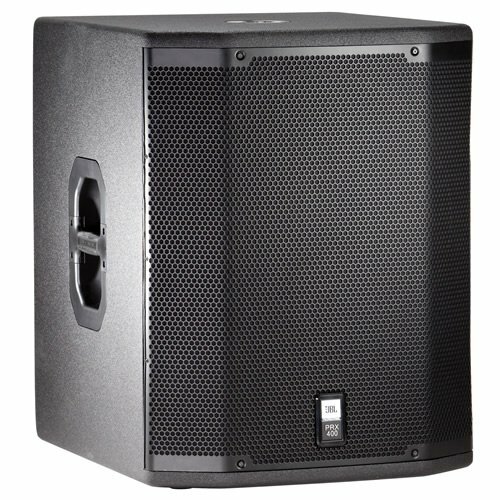 The PRX418S is a compact, high-power subwoofer system containing a JBL Selenium 18" woofer for extended low-frequency output. The system offers complete input connection flexibility for compatibility with a variety of cabling schemes. The input panel incorporates a pair of Neutrik Speak on NL-2 / 1⁄4" TS phone combo jack connectors wired in parallel. The PRX418S is supplied with pins +1/-1 connected to the woofer. The front-loaded, vented enclosure is designed to present a minimum frontal area for an unobtrusive, professional appearance. Low-profile and compact, the enclosure is constructed of birch/poplar multi-laminate hardwood and coated in JBL’s rugged DuraFlexTM finish. The distinctive 16-gauge steel grille is CNC-machined for precision and internally lined with an acoustically transparent screen to provide additional driver protection and give a very professional appearance.